Gun Control has been an increasing issue in the United States for years now and yet we have still remained stagnant when it comes to preventing firearms getting into the wrong hands. In this graph it shows that the U.S not only doubles but almost quadruples the homicide rates in countries like Switzerland and Belgium, not to mention it goes up to 10 times the amount in other developed countries. Knowing countries like Australia and New Zealand have more strict gun laws and a lack of firearms, there homicide rate comes at no surprise, but when it comes to countries like Switzerland and Belgium, there's a small difference in gun control and they carry almost the same amount of firearms as the united states, yet their homicide rates are much lower. (Video). This video looks at gun control from multiple perspectives and not just gun homicides. It sheds light on the lack of gun control laws in America and the consequences that have come because of it. the video explains that not only homocide rates go up because of this lack of gun control but also suicide rates and gang violence. Most people don't look at the suicide perspective of gun control but more than half of suicides in America are caused by guns and that's because there so easily obtained. This is important because most people who even commit suicide and don't succeed don't end up commiting it again. The prevention of guns getting into a unstable persons hand can save thousands of lives and that can all be prevented by gun control. High-profile mass shootings in the United States in recent years have rekindled the gun control debate and raised comparisons of policies around the world. Although some countries like Norway have a relatively high gun ownership rate, most are close to the bottom of the list when looking at gun homocide rates unlike the United States. 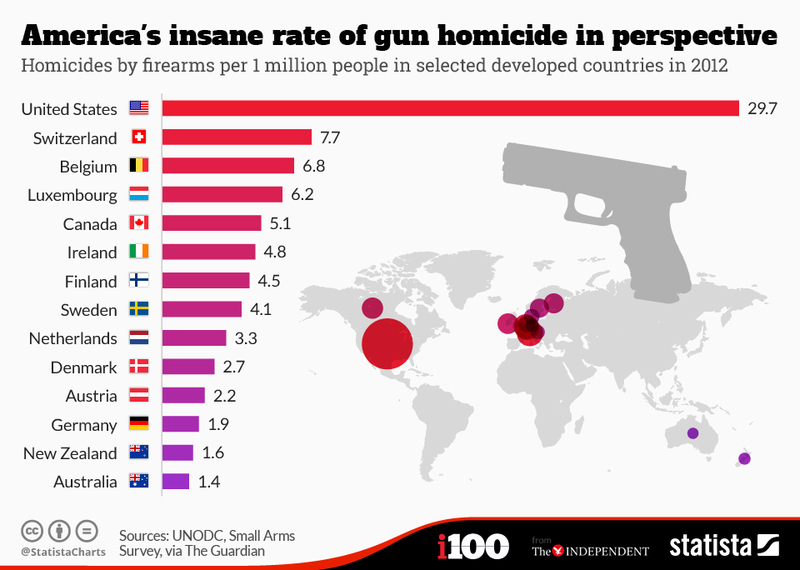 Unfortunately the United States is placed first in the list not only due to its high amount of gun ownership but because of extremely little gun regulation. Unlike countries who administer background checks and require reason to carry a fire arm the United States does not. In January 2016, President Barack Obama took several actions intended to decrease gun violence, including a measure requiring dealers of firearms at gun shows or online to obtain federal licenses and conduct background checks. As of 2017, there were no federal laws banning semiautomatic assault weapons, military-style .50 caliber rifles, handguns, or large-capacity magazines. Weapons like these are banned in countries in countries such as Japan, Canada, Australia, and United Kingdom. In this article Kiger speaks about gun control in the US versus gun control in other counties such as Switzerland and Finland. Although those countries have a high rate of gun ownership, Finland with 69 guns per 100 people and Switzerland with 61 guns per 100 people, they have a relatively low crime rate with gun violence. Switzerland has a rate of .52 per 100,00 people and Finland has a rate of .26 per 100,000 people. Compared to the US gun crime rate of 2.9 per 100,000 people, Switzerland and Finland have way less gun violence. This has a lot to do with those counties strict gun laws.